We opened up our GitHub repo earlier this week. If you think you’ve found a bug, you can file it in our issue tracker. We’ve also added a “File a bug” link to the footer that appears on every page. 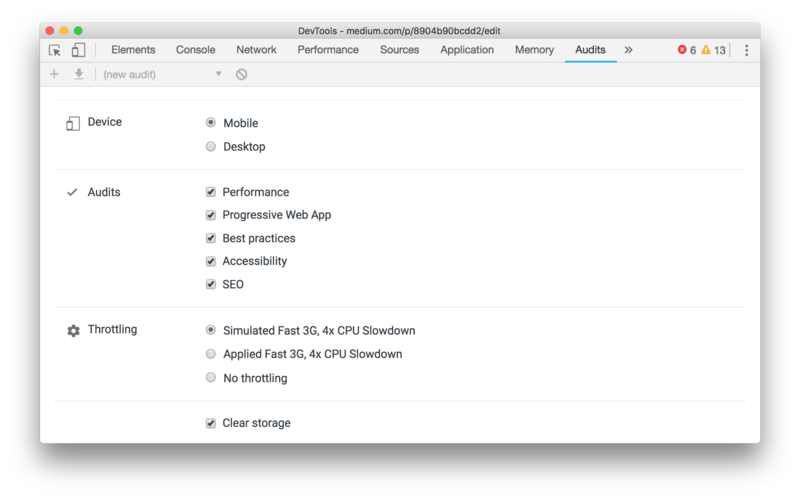 web.dev’s measure tool is using the new PageSpeed Insights v5 API which is powered by Lighthouse. By default, the API uses mobile emulation, simulating network latency and a slower mobile CPU. The settings are explained a bit in this GitHub issue and we plan to make add an explainer to the measure tool to make this more clear. In the meantime, when you run Lighthouse locally be sure to set Device emulation to Mobile and Throttling to Simulated Fast 3G, 4X CPU Slowdown. Where are the accessibility guides? Frequent Error: 500s from the Lighthouse API. The Lighthouse team is still working on this one. For the time being we’ll leave these audits off. The Lighthouse team is still working on this one as well. This audit is also disabled for now.